This document explains how to create a Google Group. If you have multiple UW-Madison G Suite accounts, select the desired account from the list provided. If you only have one UW-Madison G Suite account, you will be logged into your account automatically. Don't see the account you are looking for? You may need to link your Office 365 service account to your NetID. 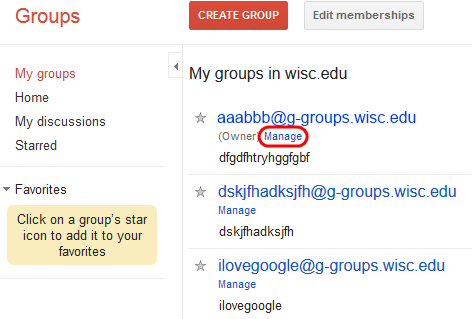 Left-click on Google Groups and select the new option to Create Google Group. Enter in the name of the group you would like to create and click the Create Google Group button. If everything was successful, you will see a message stating so. You can now manage this group by clicking the Google Groups Administration link. 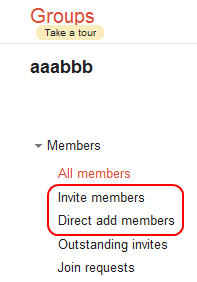 If there was a problem creating the Google group: Try first renaming the group. Spaces are considered invalid characters in Group names. Make sure to check the Groups as well to make sure the Group wasn't already created. Occasionally an error message is displayed even though the Group was actually created. Once you've logged in, the site will re-direct to the Google Groups Homepage . To open up your group select My Groups and choose the Google Group you just created. To add members to the group, find the Manage button located below the address of your group and left-click this button. The manage page will give you options to Invite members. You now have a new Google Group and are ready to invite new members. For more information on configuring your Google Group, view Google's documentation on Starting with Google Groups as an administrator.